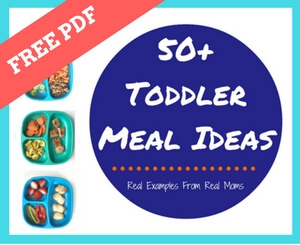 Ready to start solid foods with your baby? Get the details as to what and how much baby should be eating with this comprehensive guide to starting solids! Warning. This post is LONG. But comprehensive. So say what you will! I was inspired to write this post because a very good friend of mine called me up one night asking all sorts of questions about starting solids with her baby. I shared what my plan was with Lily [similar to what I had done with Anthony and Joey]. I took her questions and essentially have made an easy-to-follow blog post on the topic of starting solids with baby. And if you want MORE than this post, be sure to scroll down to the bottom of this post for additional resources I’ve found helpful on this topic. Note: The American Academy of Pediatrics recommends that breastmilk or formula be the sole source of your baby’s nutrition for the first 6 months of life. That’s why I waited to feed Lily solids until then. However, if your baby is physically showing signs of readiness then your doctor may give you the OK to start solids anywhere between 4-6 months. There are essentially two schools of thought when it comes to starting solids with your baby. The first, the traditional start with purees around 6 months of age [earlier if your baby is showing signs of readiness] and gradually starting introducing chopped or soft finger foods 8-9 months of age. OR, there’s baby led weaning, where you skip the purees all together and start with soft finger foods around 6 months of age, or when baby has developed a stronger pincer grasp. With Joey I did the traditional route. And with Anthony and Lily I did [or am doing] more of a modified baby led weaning approach. So a mix of both! I’d encourage you to listen to your baby and your own instincts— if baby led weaning makes you nervous, then heck, start with purees! That’s what the American Academy of Pediatrics recommends. But if you feel like your baby is developmentally ready for SOLID solids and is strong enough to pick up pieces of food and put it directly in their mouth, then baby led weaning might be for you. I’ve compiled the most important information from this blog post and put it into a printer-friendly PDF just for you. You can also pin this image to save and read this post later too! Look for physical signs that your baby is ready for solids, such as she can sit up with limited support, and has good head and neck control, and she can keep most of the food in her mouth, swallowing it. Solid foods can be introduced between 4-6 months of age. After 6 months finger foods or other table foods can be introduced based on your discretion and your baby’s readiness. Wait three to four days before introducing another allergenic food [peanuts, tree nuts, soy, eggs, wheat, shellfish, fish] to your baby. If you suspect a reaction, stop feeding your baby the new food and contact your pediatrician. Offer a variety of healthy foods, even multiple vegetables, at each meal. It is also important to offer protein/meat and iron-rich foods, particularly for breastfed infants. Don’t stop breast or formula feeding. Continue providing breastmilk or formula as the main source of your baby’s nutrition and calories for the first year of life. Never add honey, salt, or sugar to baby food. These should never be added to “entice” or “trick” your baby into liking a certain food. Try to relax: Most of the first few solid-food feedings wind up on your baby’s face, hands, and bib. Never feed your baby solid foods from a bottle. Always spoon-feed from a bowl, not from the jar of baby food unless she will finish it. Never force-feed your baby. Stop feeding your baby when she turns head away from spoon or keeps her mouth closed. I follow the Ellyn Satter division of responsibility when it comes to feeding. Parents or caregivers provide the food, and when and where the child is fed, and then the children decide what and how much they’ll eat. Learning to feed a child is an experience for both the parents and child. Children are not only learning to eat, but they are eating the amount THEY need. For example, for this stage of feeding babies, when your baby is turning their head away from you or pushing food off their tray, they are a. finished or b. not a huge fan of that particular food! Here’s a quick, sample schedule that I roughly followed with the kids when they were babies. And I use the word schedule lightly. This isn’t EVERYDAY. Some days are busier than others and baby might miss a taste or two of food. And sometimes baby nurses more than 4 times a day and more than once at night. But again, we aren’t feeding babies solids because they need a certain amount of calories from solid foods. We are feeding them solids at this age so they can learn to explore, taste, and have fun with new foods and textures! You could make life even easier by thinking of your mealtime as the same mealtime for your baby. Some people skip the purees and feed their babies with a method called Baby Led Weaning [BLW] around 6 months of age. Baby-led weaning essentially means you skip pureed, spoon-feeding with your baby and your baby starts self-feeding around 6 months of age [with the continuation of breast milk or formula]. This method is a great option if you find your baby has developed a pincer grasp [which most babies do around 8-10 months], which means she’ll be able to pick up smaller objects/pieces of food between her thumb and forefinger. According to multiple BLW resources, babies are developmentally capable of feeding themselves by 6 months of age, so there is no need for pureed food. Your job is to offer your baby bite-sized or soft pieces of food at the table [essentially the same food the rest of the family is eating] and it is up to your baby whether or not he or she eats it, and how much they eat. This is in contrast to the spoon-feeding, traditional pureed method to start solids with babies. While both methods can work well for your baby, one is not superior to the other. What is most important is that you, as the parent, are comfortable with starting solids with your baby, and that your pediatrician gives you the go ahead. Ultimately both methods can be seen as baby-led as long as you watch your baby carefully and allow them to control their own hunger and fullness cues. Concerned about allergies? Me too! Guess what? The recommendations of when to introduce highly allergenic foods have changed. Now we can introduce 7 of the 8 allergenic foods when we introduce solids, as early as 6 months of age [peanuts, tree nuts, eggs, soy, fish, shellfish, and wheat]. Research points at the fact that the longer we waited on giving children these highly allergenic foods, the likelihood for them having an allergy was greater. Note: If a history of severe food allergies runs in your family, talk to your primary care provider before introducing allergenic foods. Also, it is safe to introduce cow’s milk based cheese and yogurt before age one, however it is recommended to wait until after age one to introduce cow’s milk. When giving your baby one of these allergenic foods, introduce one food at a time, wait a couple of days and then try another one to watch out for any reactions, which would indicate a sensitivity or allergy. Also, if you do have food allergies in your family, you may want to talk to you pediatrician about when to introduce peanuts, eggs, etc. Phew! When it comes to starting solids here’s what I know: do your very best to offer a variety of foods and textures and flavors, and your little one will decide how much or what to eat. Also, the period of pureed foods for babies is over so quickly. So do not stress too much about it. Just beware: things get a whole lot messier from 12 months and beyond during toddlerhood. Soon enough the stage of purees and chopped foods will be over, and your baby will be eating exactly what everyone else in the family eats! Thank you for this! As an RD who works with new moms, this is a perfect summary of all the recommendations as well as some practical tips. Aw thank you Lindsay! I’m so glad you find this info useful for your clients! Thank you, love the graphics, tha article is clear and helpful. My sister recomended me an e-book “How To Introduce Solid Foods To Your Baby” by Susan Urban from parental-love.com. Of cours it is not a knowledge in a pill like here, but I must say that it is also well prepared. Martha thanks for the link, I found this guide very helpful but I can’t agree with you, that it isn’t a knowledge in a pill. comparing to other guides, Susan Urban keeps it simple as it should be. everything is clear and prepared in a way you can make a cheat sheet.